On the day of the wedding, the groom and his attendants rent their suit from a formal attire shop to ensure the same style and color of suits. The groom’s suit should complement the bridal gown. The groom wears a suit with a white shirt and a bow tie or neck tie and a corsage in his jacket lapel. Modern day grooms are choosing to wear colors that will blend in with the rest of the bridal party or the flowers, whether it be their shirt or tie or with an added vest. The colors for the bride’s attendants should be decided before you organize the colors for the male attendants. As with the bride, the groom should stand out from the rest of his attendants. 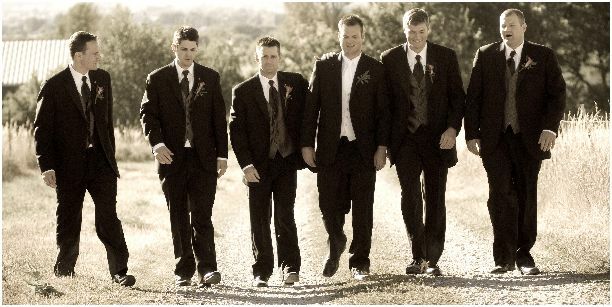 The groom’s outfit can differ from his attendants through the use of a colored vest, tie or shirt. The groomsmen can complement the bridesmaids by wearing a cummerbund or shirt in the same colour as the bridesmaids gowns. This has a great effect for photographs and when they are in line for official duties. You may choose to have their accessories of similar colour to the groom, but remember that the groom needs to stand out from his attendants. As with the bride’s attendants, the groomsmen are responsible for the cost of their suit hire and for any other accessories. The groom and his attendants need to go shopping together to tailors or suit rental shops to ensure that everyone is happy with the selection. Arrange to have regular fittings and a final fitting no later than a week before the wedding.The groom and his attendants normally all wear the same color shoes, traditionally black, but not necessarily of the same style. If possible, take the shoes along to the first fitting to see if different shoe styles are suitable. No matter what the groom and his attendants choose to wear on your wedding day it should give the bridal party a beautiful yet uniformed look .ENJOY!!! This entry was posted in Uncategorized, Wedding Advice & Tips, Wedding Details, Wedding Style and tagged bridal, Budget & Finance, Groom, groomsmen, Layne Corban, marriage, Wedding Day, Wedding Details, Wedding Planning. Bookmark the permalink.